- The daedra skeleton is strengthened. - Fixed a vampire skeleton that could cause the crash of the game. - Fixed the appearance of the vampire skeleton. - Fixed problems with aggressiveness in some skeletons. - Added keywords for better compatibility with USLEEP. - Edited the fighting style of the red eagle. - Added the red eagle stats from the BB. 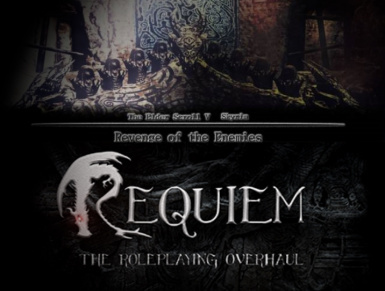 - Added keywords for Requiem SkyProc. - Classic: Some skeletons have the ability to resurrect from SiC. - Classic: Edited lvl-sheets with mobs for better compatibility with SiC. I like the abilities that are distributed to the enemies of ROTE. But the existing patch for requiem did not suit me. You will not find opponents with Auto Levels (All enemies, including those that ROTE adds, will have a static level). Maximum combined abilities and perks of ROTE with abilities and perks of Requiem. The stats of the enemiesfrom ROTE are adjusted to the stats of the enemies from Requiem. (You will not find a Dwemer mechanism with the amount of HP as a bandit). Nota Bene: Although the mods themselves are not required, you still need to use them to see all the changes introduced by these add-ons. In the patch only conflicting records are combined. Light – Just a patch for ROTE, nothing superfluous. somewhere. Therefore I will be grateful to the detailed bug reports and constructive criticism.